Login / Register to view all OUR PRICES! You will earn 3,526 Reward Points. Earn 1 reward point for every 1 dollar spent. 2019 model, meets the newest EPA and DOE codes. Perfect for slicing and dicing, this Beverage Air SPE48HC-12-SNZ Elite Series? Sandwich Top Refrigerated Counter also features chilled food storage compartments for absolute freshness. This worktable is 52.75 inches tall, 48 inches wide, and 29.25 inches deep. 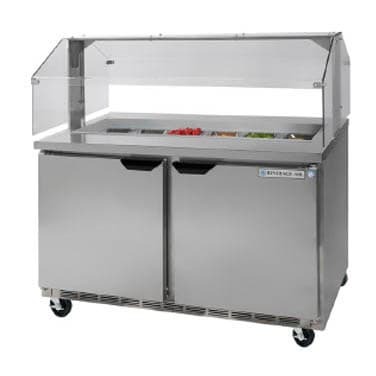 All around prep table series with enhanced refrigeration system and new and improved grille system for better airflow and less temperature gradient. Improved design envelops cold air around pans and provides uniform temperature distribution throughout the cabinet. Airflow assures that product in open containers is kept below 41°F and above freezing. This translates into increased product shelf life, higher quality food, better food appearance, fresher product and a reduction of bacteria build-up to combat food-borne illnesses. Hinges also allow doors to stay open 120°. Digital thermometer on door to monitor interior cabinet temperature. Sneeze guard assembly constructed of stainless steel and clear plastic. Dual-sided countertop is constructed of stainless steel for added durability. Two epoxy-coated steel wire shelves per door section supplied as standard. A plug in type vinyl magnetic gasket is attached to each door for positive seal. Cabinet insulation is CFC and HCFC-free foamed-in-place polyurethane of two-inch minimum thickness. Exterior construction includes heavy-duty stainless steel finish on front, sides, top, door(s), back and grille. Six-inch adjustable legs are standard. Six-inch casters and three-inch ADA compliant casters are available. Doors (cabinet front only) are mounted to face of cabinet on cartridge style hinges permitting them to self close. Door handle is made from extruded aluminum with a black anodized finish. It is contoured to permit easy opening of doors with fingers from both top and bottom of handle. SPE27-SNZ will accommodate 8-1/6th size pans. SPE48-12-SNZ will accommodate 12-1/6th size pans. Pans furnished are 4” deep and made of polycarbonate plastic and are centered for service on both sides of unit (will accommodate up to 6” deep food service pans - not included). More robust refrigeration system provides added capacity and efficiency. Automatic condensate evaporator is provided to eliminate the need of floor drains. Recirculated, forced air from evaporator is moved under pans, which are recessed 2” from top of cabinet. Forced air over the condenser is drawn through grille under door as well as the back and bottom of cabinet. Systems are designed using CFC free R134a refrigerant and capillary tube between condenser and evaporator. Designed and tested in 86°F ambient to 2009 NSF/ANSI 7 standard to hold food product below 41°F. Food must be pre-chilled before placing into pans. Approvals: UL-EPH, NSF7 for Open Buffets, and Canadian (CSA). Units pre-wired at factory and include 8’ long cord and plug set located at rear, bottom left.